In 2016, the US market reached new highs and stocks in a majority of developed and emerging market countries delivered positive returns. The year began with anxiety over China’s stock market and economy, falling oil prices, a potential US recession, and negative interest rates in Japan. US equity markets were in steep decline and had the worst start of any year on record. The markets began improving in mid-February through midyear. Investors also faced uncertainty from the Brexit vote in June and the US election in November. 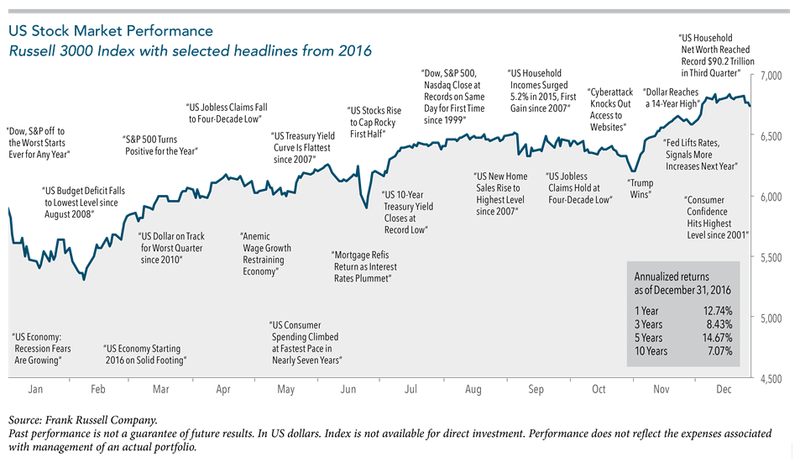 Many investors may not have expected global stocks and bonds to deliver positive returns in such a tumultuous year. This turnaround story highlights the importance of diversifying across asset groups and regional markets, as well as staying disciplined despite uncertainty. Although not all asset classes had positive returns, a globally diversified, cap-weighted portfolio logged attractive returns in 2016. Currencies The British pound, euro, and Australian dollar declined relative to the US dollar, while the Canadian dollar and Japanese yen appreciated relative to the US dollar. The impact of regional currency differences on returns in the developed equity markets was minor in most cases. US investors in both developed and emerging markets generally benefited from exposure to certain currencies. A yield curve is a graph that plots the interest rates at a specific point in time of bonds with similar credit quality but different maturity dates.